Practice League is a law practice management and e-billing suite designed to help users greatly improve their effectiveness, efficiency, and productivity in the law firm without the hassles of setting up a dedicated IT infrastructure with IT resources. It is a powerful and ready-to-use software specially designed for growing law firms. Practice League is a product of Uberall Solutions Ltd, an ISO-certified company with years of technology experience and global clients. 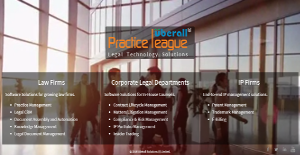 Practice League is one of the product suites offered by Uberall for Law Practice, Corporate Legal Department Framework, and Compliance Management Solutions which have become the platform of choice among a growing number of corporate law firms and legal departments. Practice League offers an easy, integrated storage and retrieval of documents. Case papers, material for research and important emails, etc. all can be read through with a single click. Users can just drag and drop bulk files including outlook emails to record audit trails, with ready integration with Google Docs, DropBox & NetDocuments made available. Practice League is cloud hosted on a secure, state of the art, scalable data centers which offer bank grade security including data center physical security, network security, host security, software security, and customer data security. Collaborative and real-time task tracking and management while working within a team is available in the software to help improve efficiency. It also lets users track and manage resource utilization and productivity by viewing activity trends, set access rules, and manage teams. Users can manage the status updates of all hearings, opposition activities, next activities and set automated reminders for next dates. Such information can be shared with their clients instantly and maintain a chronological history of every matter related to the event as well. Practice League’s Practice Cloud solution also enables the search function throughout the entire database of matters, contacts and special tags provided to find a potential conflict. If any conflicts are found, the same are highlighted for further review. If you are considering Practice League it might also be sensible to examine other subcategories of Best Law Practice Management Software listed in our database of SaaS software reviews. Every business has its own characteristics, and might require a particular type of Law Practice Management Software solution that will be adjusted to their company size, type of customers and employees and even individual industry they cater to. We advise you don't count on finding a perfect services that will be suitable for each business no matter what their history is. It may be a good idea to read a few Practice League reviews first and even then you should keep in mind what the software is supposed to do for your business and your employees. Do you require a simple and intuitive service with only essential features? Will you really use the advanced tools required by pros and large enterprises? Are there any specific tools that are especially useful for the industry you operate in? If you ask yourself these questions it will be much easier to find a trustworthy solution that will match your budget. How Much Does Practice League Cost? During the first year, the SMB and enterprise pricing scheme is the same for all clients – $15 per client per month. In the succeeding years, prices are calculated on quote basis, depending on which features the company wants to include. We realize that when you make a decision to buy Law Practice Management Software it’s important not only to see how experts evaluate it in their reviews, but also to find out if the real people and companies that buy it are actually satisfied with the product. That’s why we’ve created our behavior-based Customer Satisfaction Algorithm™ that gathers customer reviews, comments and Practice League reviews across a wide range of social media sites. The data is then presented in an easy to digest form showing how many people had positive and negative experience with Practice League. With that information at hand you should be equipped to make an informed buying decision that you won’t regret. What are Practice League pricing details? What integrations are available for Practice League? If you need more information about Practice League or you simply have a question let us know what you need and we’ll forward your request directly to the vendor.